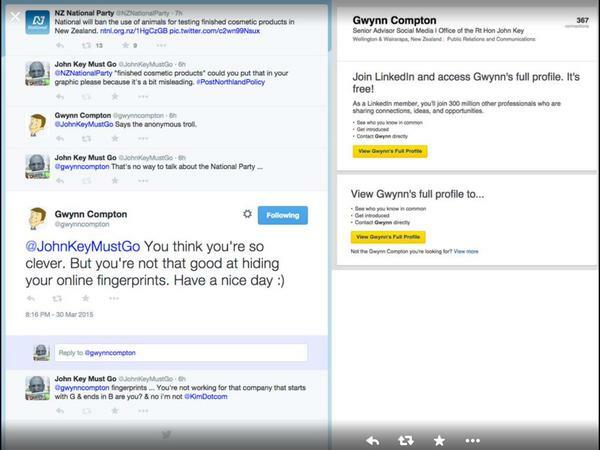 Gwynn Compton is “Senior Advisor Social Media” in Key’s office. PM’s staff threatening people on Twitter. Such a good look. Mark Textor is also known to take things personally. In response to my post on whether he was working for Fairfax or Fairfax for him, I got this twitter rant and while you might not agree with me or think I am nuts period, it is interesting that one of the members of the team accredited with winning the last election in England, would come down from his high and mighty perch to call me a cokehead conspiracy nutter for asking that simple question. they are insecure little boys. He needs to be sacked before his threats catch up with him. This is out of order. They should stand down. Isn’t it great to know that the GCSB has access to all of the NSA’s cyber spying tools. Reckon it was locked down this morning? Exactly. With any luck it’ll stay that way for a long, long time. Its that too scary. Must be the GCSB interface with Twitter that allows them to know all this. Is that social media link working for anyone? Whenever I see a male in charge of social media, I know catastrophic fail can not be far away. That’s alright then. Luckily it is not a Key operation. So does this threatening message come from the Office Of The PM? Because as I understand it, when the Office of the PM speaks, that’s the PM speaking. Depends who is wearing the hat. Hats for Hydras – a business with unlimited growth potential. If this twitter account speaks for his Office, then it’s him. In this case they seem to be doing the ‘PM speaking ‘ on social media, so thats a yes! Compton’s tweet is from the end of March. It was an attack on an activist anti-govt twitter account. I’m not seeing a connection with the social media fiasco tody i.e. Compton was already pissed off at the account before the flag thing. Where’s the threat? What did he threaten to do ? I know where you live. What did I just threaten to do? But I know who you really are, and I have the resources at my disposal to keep an eye on you. Cut it out you guys, no need for all the fuss. I’ve had a chat with Realblue’s employer and he’s going to sort him out for us. Gone by lunchtime, I reckon. And how’s it going, the creeping business? Nice play on words. It’s commonly known Curia staffers are independent contractors, it’s part of the aspirational aims of the business, so you’re mainly right. Did he grasp the nature of the threat? Or does he need another clue? Oh, are we pretending he was genuinely confused from the beginning? It can be awkward when evil henchmen can’t take a hint. Revert to your normal stalking behaviour? Is that you, Gwynne? Definitely smart enough. With a name like Gwynn Compton he’s gotta be a twerp. But, as we know, the PM’s Office is full of em.
. . . 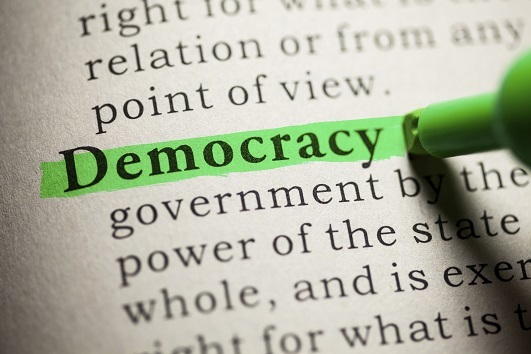 Roll with the punches, don’t dig deeper: The internet is a fickle beast at the best of times. Often what you put out there isn’t going to be received, interpreted or reacted to in the way you planned. If things don’t go to plan, the worse possible thing you can do is get nasty and get more radical. It only serves to dig you deeper in your hole . . .
. . . yep, you guessed it. Be interesting to see whether the story appears in the print edition. Claire Trevett may want to emend her comment ” . . . Mr Compton has since locked his Twitter account and removed any reference to Mr Key’s office from his LinkedIn profile . . . ” because Gywnn’s LinkedIn page still has the reference to John Key’s office. Mind you, perhaps Claire was told the reference was removed before Gywnn was told to remove it. In my opinion childish behaviour…..
On a different note, we got a “what do you stand for card?” in our mail box. My husband filled it out with “the arrest, trial and imprisonment of the Key Cabinet”. and then duly posted it off. Maybe it needs a better airing on this social media outlet.